There are many reasons to select an appraiser for your goods. Moving? Considering an estate sale? Dealing with a life transition such as a loss of family member or divorce? For whatever your reason, selecting appraisal services for your most cherished valuables is a wise decision, and care and concern should dedicated to making sure you have the best appraiser for your unique situation. If this is your first time selecting an appraiser, let’s discuss several very important elements to research in choosing an appraisal provider. Receiving a professional accreditation is a testament to an individual’s dedication to their craft and area of expertise. 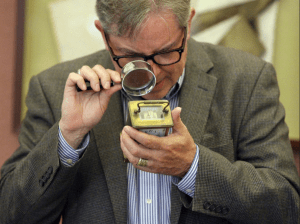 In the world of antiques, there are 2 major organizations responsible for granting accreditation: The International Society of Appraisers and the American Association of Appraisers, respectively. These associations are committed to the continued practice and study of antiques research in various areas from fine art, historical/vintage artifacts, jewelry and gemology and more. Ask your potential appraiser if they possess any current accreditation. Your valuables are too important to be left at the hands of someone inexperienced. Liquidizing an estate? Well, it can be difficult to transport all of your valuables to an appraiser’s shop or office. Ask your potential appraiser if s/he travels and will be available to come to your home, office or other personal property. There may be additional fees for this convenience, however the peace of mind is worth it and you can leave your valuables packed safely at home. Don’t risk damaging sensitive materials in transportation. Most appraisers are willing to travel due to the nature of the business. Research your potential appraiser’s area of expertise in the goods you are looking to appraise. There are various sub-specialties in antiques appraising in which you want to be confident that your appraiser is fluent and is an expert in. For example, some appraisers are specific in appraising specific items, i.e. furniture, automobiles, jewelry, fine art, machinery & equipment, etc. Word of mouth is the best form of marketing. Go to your local antique store and ask if they are familiar with any local appraisers. Write down the names that come up during your questioning and use the list as a foundation for your search. Next, ask your list of potential providers if they have any former or current clients in which you can speak with, or get more information from. Many clients may have signed a confidentiality agreement with their appraiser, however if there are any public estate sales or public relationships that you can connect with, use their experience to help ease your decision making process.